When a daughter turns marriageable age, what should a responsible father do? Easy- wed her to the most suitable boy who comes knocking on the door. Jai Bharadwaj, Mili's father and owner of The Serenity Tea Estate in the idyllic Nilgiris would've probably liked to do the same, but being who he was, he had to ask her first. What would she say? ‘Milan’ is a story of a bubbly, straight forward young girl ‘Mili’. 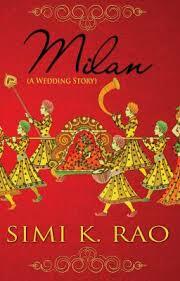 This novel captures the changes in her life from a marriage proposal through the wedding. Mili is a graduate in Music and an aspiring Sitar artist. She wants to pursue her career in music and visits her home-town ‘Coonoor’, which is a hill station in Tamilnadu to meet her parents who own a tea plantation there. Marriage was not in her thoughts at all until a sudden proposal comes from Mrs. Kapoor for her son ‘Aahaan’. Aahaan was Mili’s classmate who she used to tease a lot in school days and she doesn’t have any inclination towards him at that time. Beautiful and innocent love blossoms between them as Mili accepts the proposal and they try to understand each other gradually. There are no twists and turns in the story. Every girl is afraid about how life might change after marriage – will she have to ask permissions for every small thing from in-laws or spouse, will she have freedom like earlier to be naughty, to enjoy, to meet her parents whenever she likes, Will the new family welcome her with love, will they encourage or support her career and other ambitions?.. Mili also goes through all these but gets assurance from Aahaan that he will support her always. The story ends with the union of their souls through marriage. There is no concept of divorce. Marriage is a sacred relationship and once married, a couple is wedded for life. Thoughts of a young yet to be married girl are captured very well and every girl/ woman gone through this phase can relate to it very well. Characterization is too ideal to believe, but it’s good. There are no villains/ bad people portrayed in the story except for a friend of Mili. The story is romantic and too rosy. Doesn’t look very practical as Mili and Aahaan are shown as made for each other and very much like an ideal couple. We can see this kind of characters only in movies. Since there are no twists and turns in the story, at one point, we will feel very bored. Mili accepts the proposal very quick after meeting Aahaan twice, which is surprising. Even though he is a childhood friend, usually, Mili should have had many questions to ask him before accepting the proposal. I would recommend this to teenage unmarried girls. Simi K. Rao was born and grew up in both northern and southern India before relocating to the U.S., where she has lived for several years. She is the author of multicultural contemporary romantic fiction. The inspiration for her books and other creative projects comes from her own experience with cross-cultural traditions, lifestyles and familial relationships, as well as stories and anecdotes collected from friends, family and acquaintances. Rao enjoys exploring the dynamics of contemporary American culture blended with Indian customs and heritage to reflect the challenges and opportunities many Indian-American women face in real life. Much of Rao's down time is devoted to creative pursuits, including writing fiction, poetry and photography. She is an avid traveler and has visited many locations around the world. A practicing physician, Rao lives in Denver with her family. Her published works include Inconvenient Relations and The Accidental Wife. She is currently at work on her next release. PS: I have received an advanced review copy from book r3vi3w tours.